Animated Step-by-Steps® are animated PowerPoints designed to address literacy, language, AAC and a host of academic goals. Each page includes a series of animations. Read the text up to the star … click … and see an animation of what you just read. If you have purchased a symbol-supported version the symbols appear AFTER all the page animations have been triggered. This strategy supports a 'literacy first' agenda to ensure that the presence of symbols will not 'steal attention' from the literacy agenda. This Go Fish Card Game is part of an ongoing series of 'How to Play' resources (Dominoes, Checkers, Connect Four, Rock Paper Scissors, I Spy, War) games that are great for promoting family fun. 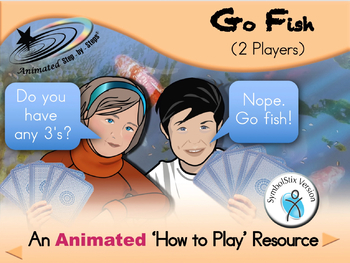 Go Fish uses a single deck of cards and can be used to reinforce simple math skills. 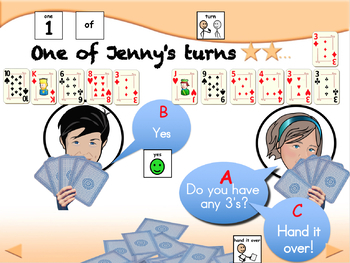 It can be played with 2-5 players, e.g. "Do you have any 8's? No? … Go fish!". 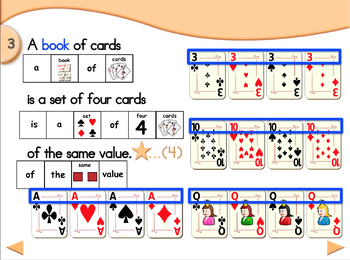 The object of the game is to acquire 'books' i.e., set of equal rank cards e.g. four 8's, four Queens, four 2's etc. The winner is the person who accumulates the most sets. Several 'practice slides' are provided. 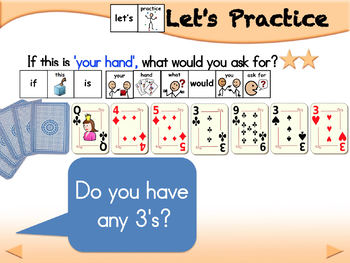 There are three versions of this resource (Regular, PCS, SymbolStix). This is the SymbolStix Version (n2y).